Pictured (left to right). McPeak's Assisted Living residents Christian Orth, Ruth Beal and Josephine Delia; Linda Ohlsen, Activities Director, McPeak's Assisted Living; and McPeak's Assisted Living residents Carmela Delisi, Mary Pascale, Josephine Caputo and Maria Teresa Brana. 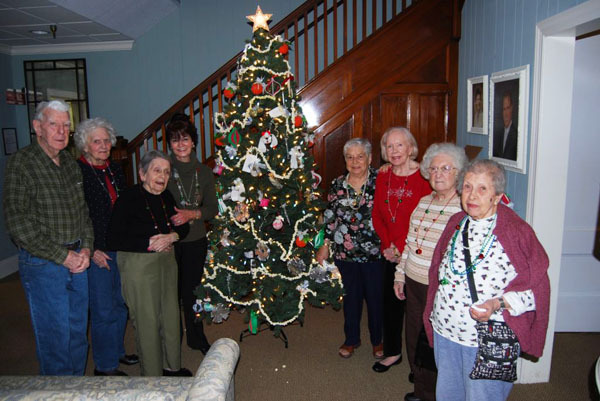 On December 10, residents at McPeak's Assisted Living celebrated the holidays by trimming two of the Christmas trees inside the facility's lounge area and TV room. As residents took turn decorating the trees, they enjoyed egg nog and holiday cookies and sang Christmas carols.